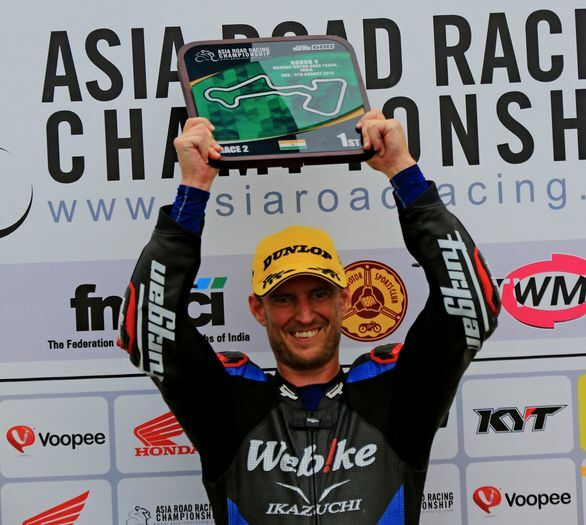 The third and final day of Round 4 for the FIM Asia Road Racing Championship (ARRC) 2018 ended on a high with SuperSport 600 (SS600) championship leader Anthony West picking up his second win of the weekend on Sunday. For Race 2, the 37-year-old threw caution to the wind to teach his younger competitors a lesson in keeping pace at the Madras Motor Race Track, Chennai. The weekend also turned out to be the best one Idemitsu Honda Racing India team rider Taiga Hada had all season with two podium finishes. Race 2 of the Asia Production 250 (AP250), Underbone 150 (UB150) as well as two rounds each of the two support races rounded out the day. 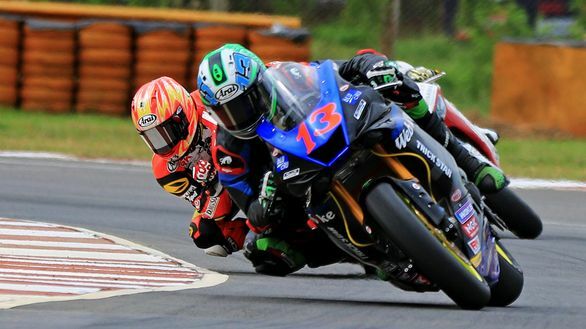 With the sun out on Sunday after a rainy evening the previous day, West (Webike Ikazuchi Racing) came out guns blazing right from the start of Race 2. He made a mistake halfway through the first lap, but recovered his position before the lap ended. And he never looked back. With each passing lap, he kept his pace and ended with a lead of over 7 seconds. Behind him, 19-year-old Hada and Tomoyoshi Koyama (Musashi Boon Siew Honda) scrapped for second place, which the latter won, with Hada finishing third. The two wins give West's championship campaign a big boost and he now has a total of 136 points. He is well on his way to becoming the first Australian ARRC champion. In second place is defending champion Azlan Shah Kamaruzaman, who trails by 51 points. Azlan who had crashed in Race 1, took 5th place in Race 2 behind Md Zaqhwan Zaidi. The most hard-fought ride of the day came lower down the grid, from Kasma Daniel Kasmayuddin. Starting the race at 17th, the Hong Leong Yamaha Malaysia rider manoeuvred his way to 6th place after 16 laps. Championship leader Rheza Danica Ahrens' dominant run came to an end after a Race 2. After 5 consecutive race wins, the Astra Honda Racing Team rider and his teammate Mario Suryo Aji both crashed out. This left the door open for new winners, and Rafid Topan Sucipto as well Andy Muhammad Fadly were both upto the challenge. As Rheza crashed in the final lap, Fadly took an outside line to go past Sucipto, but the latter held his line and the two riders even bumped shoulders before going into the final corner. In third behind them was Anupab Sarmoon who had led the race after Rheza's bad start. In terms of the championship, Rheza still leads the chart at 148 points with Mario 26 points behind. Sarmoon however has cut down the lead, and has 108 points. For Indian racers Rajiv Sethu and Anish Shetty, the outing wasn't great as they ended Race 2 16th and 19th, respectively. Among the noteworthy podium finishers of the day was 14-year old Australian boy Travis Hall who fought his way to third place, his first podium of the season, in Race 2 of the highly competitive Underbone 150 class while Malaysians Ahmad Fazli Sham and Md Helmi Azman took the top two positions. Bengaluru's Abhishek Vasudev and Aravind Balasubramaniam (Chennai) shared the honours in the two Idemitsu Honda India Talent Cup races. 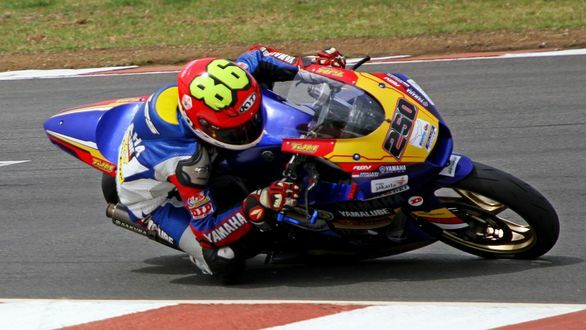 However, in the championship stakes, Coimbatore's Senthil Kumar, with two second-place finishes, moved to the top of the leaderboard with 99 points, ahead of Vasudev (88) and Anish Shetty (86) who sat out both the races due to injury. The TVS One-Make Championship (Apache RR310) double-header dished out close races as Vivek Pillai and PM Soorya, both from Chennai, won one apiece. The victory helped Pillai (94 points) close in on championship leader Deepak Ravikumar (98), who finished second and fifth in the two races, Soorya managed to move up to mid-table with a tally of 33. 3. Travis Hall (Australia, SCK Rapido Hi Rev Honda Racing Team) (19:03.008).